We report a measurement of the CP-violation parameter sin⁡2ϕ1 at the Υ(5S) resonance using a new tagging method, called “B-π tagging.” In Υ(5S) decays containing a neutral Bmeson, a charged B, and a charged pion, the neutral B is reconstructed in the J/ψKS0 CP-eigenstate decay channel. The initial flavor of the neutral B meson at the moment of the Υ(5S)decay is opposite to that of the charged B and may thus be inferred from the charge of the pion without reconstructing the charged B. From the asymmetry between B-π+ and B-π- taggedJ/ψKS0 yields, we determine sin⁡2ϕ1=0.57±0.58(stat)±0.06(syst). The results are based on 121 fb-1 of data recorded by the Belle detector at the KEKB e+e- collider. We present a precise measurement of the CP violation parameter sin⁡2ϕ1 and the direct CP violation parameter Af using the final data sample of 772×106 BB̅ pairs collected at the Υ(4S)resonance with the Belle detector at the KEKB asymmetric-energy e+e- collider. One neutral B meson is reconstructed in a J/ψKS0, ψ(2S)KS0, χc1KS0, or J/ψKL0 CP eigenstate and its flavor is identified from the decay products of the accompanying B meson. From the distribution of proper-time intervals between the two B decays, we obtain the following CP violation parameters: sin⁡2ϕ1=0.667±0.023(stat)±0.012(syst) and Af=0.006±0.016(stat)±0.012(syst). Steering a quantum harmonic oscillator state along cyclic trajectories leads to a path-dependent geometric phase. Here we describe its experimental observation in an electronic harmonic oscillator. We use a superconducting qubit as a nonlinear probe of the phase, which is otherwise unobservable due to the linearity of the oscillator. We show that the geometric phase is, for a variety of cyclic paths, proportional to the area enclosed in the quadrature plane. At the transition to the nonadiabatic regime, we study corrections to the phase and dephasing of the qubit caused by qubit-resonator entanglement. In particular, we identify parameters for which this dephasing mechanism is negligible even in the nonadiabatic regime. 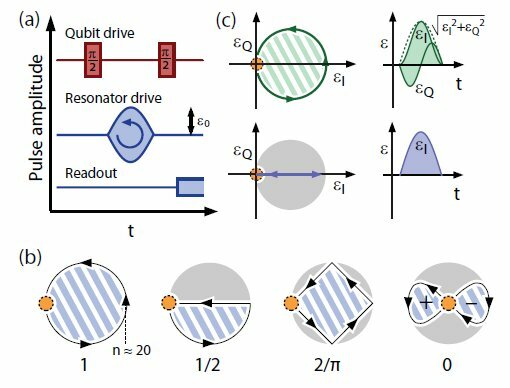 The demonstrated controllability makes our system a versatile tool to study geometric phases in open quantum systems and to investigate their potential for quantum information processing. F. P. An et al. The Daya Bay Reactor Neutrino Experiment has measured a nonzero value for the neutrino mixing angle θ13 with a significance of 5.2 standard deviations. Antineutrinos from six 2.9 GWth reactors were detected in six antineutrino detectors deployed in two near (flux-weighted baseline 470 m and 576 m) and one far (1648 m) underground experimental halls. With a 43 000 ton–GWth–day live-time exposure in 55 days, 10 416 (80 376) electron-antineutrino candidates were detected at the far hall (near halls). The ratio of the observed to expected number of antineutrinos at the far hall isR=0.940± 0.011(stat.)±0.004(syst.). A rate-only analysis finds sin⁡22θ13=0.092±0.016(stat.)±0.005(syst.) in a three-neutrino framework. We theoretically show that completely stochastic fast physical random bit generation at a rate of more than one gigabit per second can be realized by using lasers with optical delayed feedback which creates high-dimensional chaos of laser light outputs. The theory is based on the mixing property of chaos, which transduces microscopic quantum noise of spontaneous emission in lasers into random transitions between discrete macroscopic states. We propose a theoretical scheme to realize a rotation-sensing interferometer with spin-orbit coupled atoms. The sensitivity of this interferometer is dependent on the atomic mass m−αwith a factor α⩾1. Thus, the sensitivity can be improved by about one order of magnitude when we choose Li instead of Rb. Furthermore, compared to the standard Raman interferometer, the response to high-frequency, time-dependent rotation can be improved through the continuous coupling between spin and orbital freedoms of the atoms. All quadratic translation- and gauge-invariant photon operators for Lorentz breakdown are included into the Stueckelberg Lagrangian for massive photons in a generalized Rξ gauge. The corresponding dispersion relation and tree-level propagator are determined exactly, and some leading-order results are derived. The question of how to include such Lorentz-violating effects into a perturbative quantum-field expansion is addressed. Applications of these results within Lorentz-breaking quantum-field theories include the regularization of infrared divergences as well as the free propagation of massive vector bosons. We suggest trying to count the number of invisible particles produced in missing energy events at the LHC, arguing that multiple production of such particles provides evidence that they constitute stable dark matter and that counting them could yield further insights into the nature of dark matter. We propose a method to count invisible particles, based on fitting the shapes of certain transverse- or invariant-mass distributions, discuss various effects that may affect the measurement, and simulate the use of the method to count neutrinos in standard model processes and dark matter candidates in new physics processes.